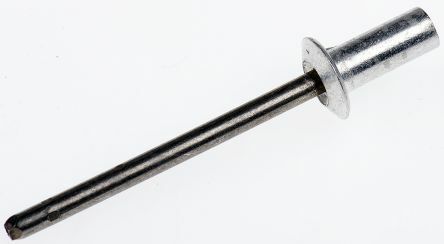 The BRS 02 blind rivet kit includes a BRS 02 rivet tool and a selection of aluminium rivets with steel mandrel and large, flat heads.211-type multi-grip-range blind rivets (flat head), with aluminium bodies and zinc-plated steel mandrel. 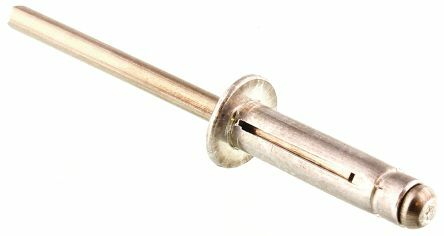 Standard open type domed head rivet, for general purpose use Aluminium alloy (3·5% magnesium) body, carbon steel mandrel. For assemblies using thin and vulnerable materials Wide grip range, with large area blind-side spead Can be used with oversized holes Aluminium alloy (3·5% magnesium) body, carbon steel mandrel. Closed end domed head rivets Moisture and pressure tight with guaranteed mandrel head retention Aluminium alloy (5% magnesium) body, carbon steel mandrel.